A brand new national franchise, Real One Real Estate, was opened an launched by well known local Pretoria real estate expert, Rothea Olivier. Rothea boasts with years of real estate experience and the creation succesfull franchise groups and businesses. 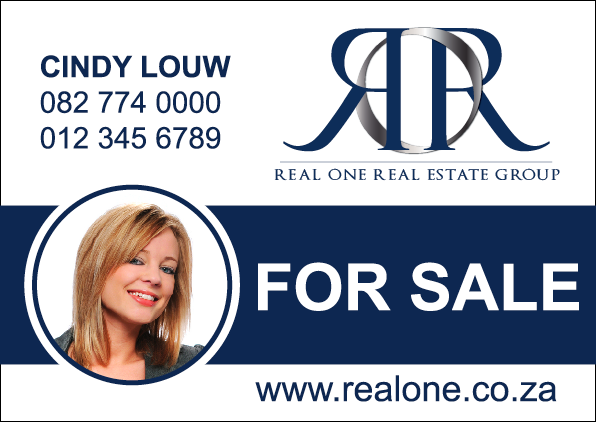 Having much to offer to the industry, Rothea and her management team launched Real One Real Estate Group. Entegral Technologies was appointed by Rothea and her team to create a fresh, professional look and feel for her brand as well as for the development of the new Real One website. All print mediums such as for sale boards, business cards, letterheads, folders were designed by our designers. Watch out for this new franchise mainly in the Pretoria area and keep an eye out for their distinctive navy blue and white colours.